10 oz crock. Lock-in-place design prevents spills. 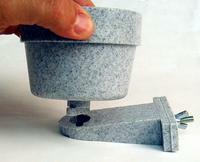 Twist and release lock detaches bowl from base for easy cleaning. Dishwasher safe. Fits all wire cages. Use on vertical or horizontal wire. Made of tough durable plastic.